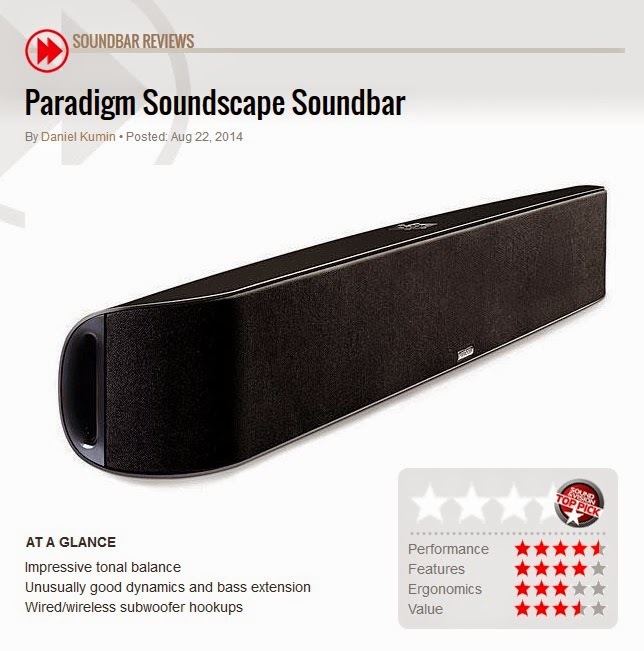 "...expectations were high as I unboxed Paradigm’s $1,500 Soundscape, a slim, round-shouldered soundbar designed, like many of its peers, for on-wall or shelf/tabletop mounting equally. (Paradigm includes extensive template and bracket accessories to make the former as straightforward as possible, and rubbery feet for the latter.) The design combines seven drivers into a trio of two-way hardware channels (the center is dual-woofer’d), each with a dedicated 25-watt (RMS) amplifier channel, and the system is supported by DSP-based surround magickery. I couldn’t wait to hook it up." "When I finally began my critical listening, I judged the Paradigm design to be a carefully tuned reproducer with open, natural vocal tonality on both male and female announcers and singers. The Soundscape struck me as leaning just a touch to the warm-and-full side of the spectrum, but otherwise just about spot-on, splitting the difference between casual TV-sound-appliance and audiophile-balanced Serious Listening device." "In fact, with the volume at its maximum setting of 100, the Paradigm proved able to deliver almost 80 decibels SPL at my listening position from THX- reference-level (–20 dB FS) test noise, which is very good for a soundbar." "All good stuff, but any soundbar is going to live or die with movies. The Paradigm continued to impress me across a clutch of favorite scenes, offering lots of clean level while maintaining clear, balanced dialogue and very respectable dynamic impact." Click here! to read the Soundscape review from Sound & Vision. Click here! for more info on Soundscape or to buy online.